I recently attended a meeting where an agenda item was to review a Microsoft PowerPoint presentation. One bullet point showed a daily cost of 37 cents. Several people wanted the bullet point to show 37¢. Others commented that there is no way to use these symbols as the cent sign isn’t on your computer keyboard. This got me thinking about how to type special characters, symbols, and accented characters. It can be confusing. Before I get into the instructions, you should know there are multiple ways to enter these symbols and there can be multiple codes for the same item. Your choices will depend on where you need the code such as a Word document, email, web page, and more. And while these codes are universal, that doesn’t mean they work across all applications. That is why it helps to know multiple ways. In addition, you could use these methods to enter the symbols. This depends on context and vendor. For example, sometimes when you create an online password, you’ll see a hint or tooltip that references non-numeric keys like @, #, $, %, &, * and +. These are easy to enter as they are on your keyboard. 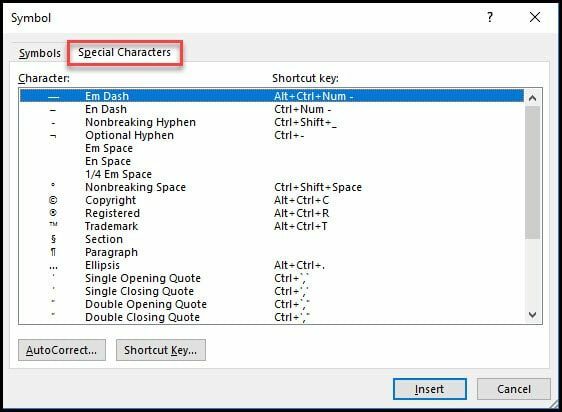 These are examples of “special characters” even though they exist on your keyboard. In contrast, there are a number of symbols that require you to enter multiple keys. There are no dedicated keyboard keys for them. 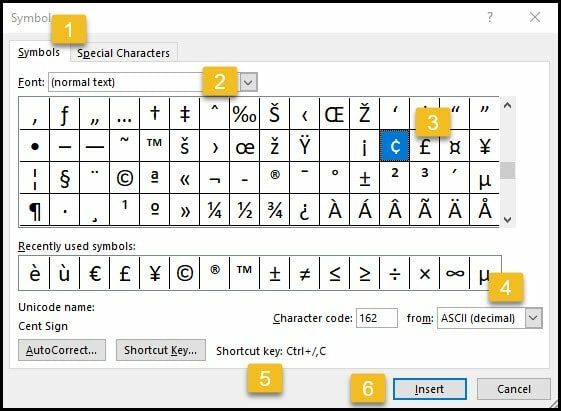 If you use one of Microsoft’s Ofice programs to insert a symbol, they have a dedicated tab for Special Characters. These special characters tend to relate to items such as formatting, punctuation, em dashes, copyright ©, and trademark ™ signs. Perhaps, a more common set of special characters are for things like accented letters, fractions, and currency symbols. For the purposes of this article, I’m going to call all these items “symbols”. This may upset some purists but I don’t want to get into code page history except to say some of these codes came about before we had graphical interfaces. Depending on your symbol, there could be a number of codes that represent it. For example, every key on your keyboard has a code that represents the same value. While the keyboard accounts for over a hundred entries, there are thousands of symbol codes when you factor in different languages. Alt codes come from pressing and holding down your Alt key and then pressing a specific set of numbers. It could be from 1 to 4 digits. These codes are useful when you don’t have some sort of symbol tool. They can also be faster if you know the code. There are 256 Alt Codes in the first set. The first 126 map pretty well to a US English keyboard and work in just about any application. The remaining items are called “extended ASCII” and work fairly well in all applications. However, there are Alt codes that have numbers greater than 255 and these can pose problems in certain programs. In particular, programs outside of Microsoft Office. You must use the numbers on the Numeric keypad. Using the number keys below your function keys won’t work. Num Lock should be on. If your keyboard doesn’t have a dedicated Numpad you may have to use a Fn key in combination with a Num Lock key. Not all symbols show on printouts even though they show on your screen. Apple has it’s own method and doesn’t rely on these codes. On a Mac, you’ll need to use the Character Viewer instead of using Alt codes. Apple has a support document on this. Trying to find the Num Lock key on notebooks can be challenging. To give example, my Asus notebook doesn’t have a dedicated key. I had to Google to find out where it was. I had to run a program called OSK that brought up an on-screen keyboard. 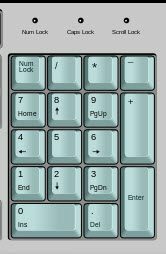 Then I had to hit an Options button to toggle Turn on numeric keypad. In cases like these, it may be easier to use a character map. 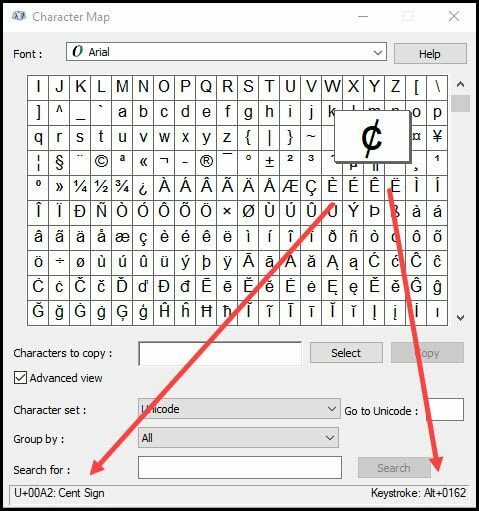 Going back to my story, here is how I could type the cents sign ¢ on a Windows PC. Open a document where you want to see the symbol. Make sure the Num Lock key is on. Press and hold down your left Alt key. Press the 1 key on your Number pad. Press the 5 key on your Number pad. 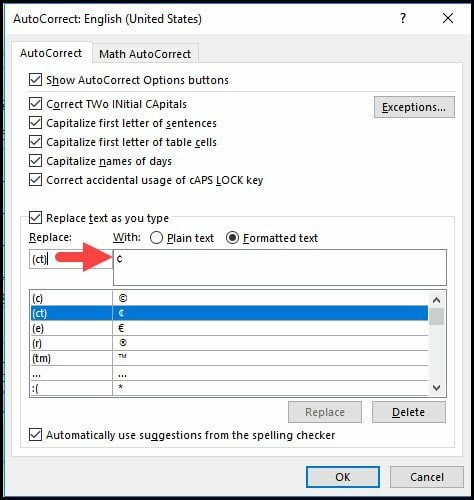 The reason I mentioned the left Alt key is that some keyboard language settings don’t allow the right side key to work. Sometimes, the Alt codes don’t work as expected. This has to do with details like rich editors, code pages, and Windows registry settings. For example, if you tried to enter the Alt code for the French Franc in Microsoft Word, WordPad, or Outlook, it would work fine. But, it doesn’t work in Gmail, Excel, my code editor or other programs. With these programs, any code greater than 255 will provide unexpected results. You’ll see a symbol produced but it won’t be the one you want which makes it more confusing. Here are some examples you can try. You might notice that lower numbers have a designated keyboard key such as the $ sign. The last example for the Euro € sign is one that has a 4 digit Alt code and you must put in the leading 0. Even though this code has 4 digits, it is still less than 256 so it works in just about any application including Gmail. The problem with finding ALT codes is not all lists are complete. Some just have the first 128 items. Others include extended ASCII and a few have all of them including the 4 digit Alt Codes that start with 0. One site that I prefer is Alt-Codes.net. It has a numeric listing which is larger than most. While it doesn’t provide the literal name of the symbol like “copyright”, it’s easy to find the graphical representation. It also provides some groupings on the sidebar and top navigation like “currency”, “language”, “gender” and others. It also has a test window where you can try out the symbol code. Unicodes are another way to represent and standardize characters. A big difference is the set size as there are well over 100,000 unicodes. Unicodes also represent many more languages. While there are symbols in the set, you won’t find things like trademarked symbols. For example, there isn’t a Unicode for the Windows symbol. The Unicodes work in a different way. You do not need to use the numeric keypad and the letters are not case-sensitive. Below are the steps to create the ¢ sign. Press 0 0 a 2. I found entering some of these codes in Excel a challenge. Although the documentation says it accepts Unicodes, I couldn’t do it using those codes. I had to use HTML codes or HTML-Entity Decimal codes. As you can see this name differs based on which lookup service I used. To give example, I wasn’t able to use the Unicode for a checkmark. I had to use a different code. 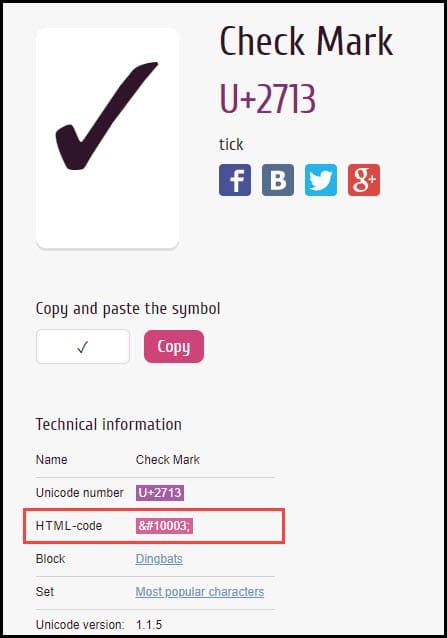 Find the HTML code for your symbol. Copy just the number. No punctuation. 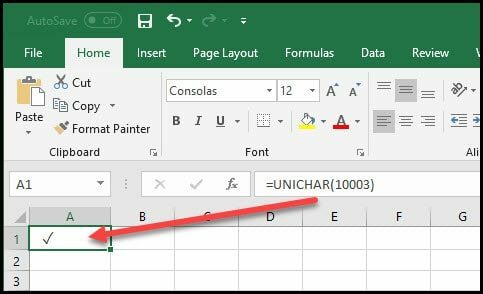 In Excel, type =UNICHAR(10003). The number in ( ) represents your HTML code. The methods mentioned above were direct and you had to know the symbol code. However, an easier method is to check your program for a menu option that allows you to insert symbols. Many Microsoft products include this option. For example, Microsoft Word, Microsoft Outlook, Microsoft Excel, and Microsoft PowerPoint all have an Insert menu with an option for Symbol. The most common symbols are included. The tool has 6 areas but these can change based on your options. This dialog is consistent with most Microsoft products. However, the free online versions of Microsoft programs have fewer symbols. This area shows your Symbols or Special Characters. The default starts on the Symbols tab. In this example, I’ve clicked the Cents symbol. This drop down allows you to select between different fonts, webdings and wingdings. Indicates the character set. The default is ASCII decimal. Depending on your selection, you may see a predefined shortcut. For the cent sign, it’s Ctrl + / + c.
To accept the assigned Symbol, click the Insert button. If you look at the screen snap above, you’ll see a shortcut has been assigned to this symbol. If you frequently use a symbol, the keystroke option may be the fastest method. You can also change the Shortcut key using the button. An alternate method is to use the AutoCorrect… button and assign a new set of keystrokes that are intuitive to you. This is the same function that allows you to type (c) and get a copyright symbol. This is a great feature. If you’re like me, you don’t like looking up codes. Instead, you just want to see a graphical representation of the symbols and say “that one!” This is especially true if the symbol is one you rarely use. For these times, you can use Windows Character Map (charmap.exe). In the Open: textbox, type character. Select the Character Map program. An insert symbol tool similar to the one in Microsoft Word appears. When you click a symbol, a larger image appears with the description and key codes displayed on the status line. You can click the Select button and then copy the symbol to your clipboard to paste into another program. Or, you can type the keystroke equivalent. Even though the character map is a system tool, it doesn’t mean the results are going to work everywhere you need it. The codes that seem to work without issue are Alt codes less than 255. And yes, it seems odd that ¼ works fine, but ⅛ produces a [. And in case you’re wondering how I got that ⅛ symbol, it has to do with another set of codes that work with HTML. Yes, another set of codes. My suggestion is to try some of these examples and test to see which ones work in your apps.